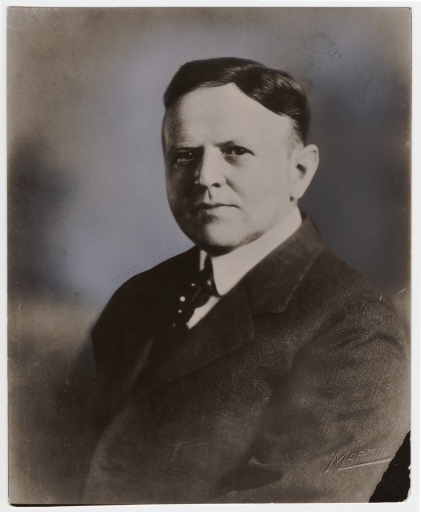 The Davenport Hotel was the brainchild of restauranteur/entrepreneur Louis Davenport. Davenport was not a Spokane native, but he found himself in Spokane shortly after the great fire of 1889. Davenport lent his hand to the cleanup and reconstruction efforts, and was able to set aside some money in the process. Soon Davenport opened a small restaurant in a tent, which he would later replace with a more permanent waffle factory at the eastern end of the block where the Davenport Hotel stands today. Davenport wasn't satisfied to stop with the restaurant, and began to make plans for the hotel. Along with architect Kirtland Cutter, Davenport set about designing a hotel for the Inland Northwest that would impress travelers from all over the world. When completed in 1914, the Davenport Hotel was truly impressive with its opulent Spanish, Italian, French, and Elizabethan interiors. It featured many modern touches, such as air conditioning, a central vacuum, and an electric sign which shone down brightly upon passers by. Time took its toll, and after the death of Louis Davenport in 1945, the condition of the hotel continued to decline until it closed in 1985. The hotel was finally restored in 2000 after being purchased by the Worthy family. It now stands open for business, with much of its original architecture still intact. Davenport's Restaurant, 1908: Taken not long before the Spokesman Review would make public Davenport's plan for a new hotel, this photograph shows what the block looked like before the hotel was built. Image courtesy of the Library of Congress. 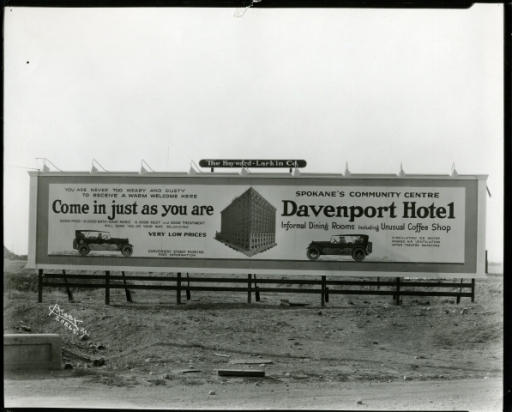 Come Just As You Are, 1921: An early billboard advertising the Davenport as "Spokane's Community Center." 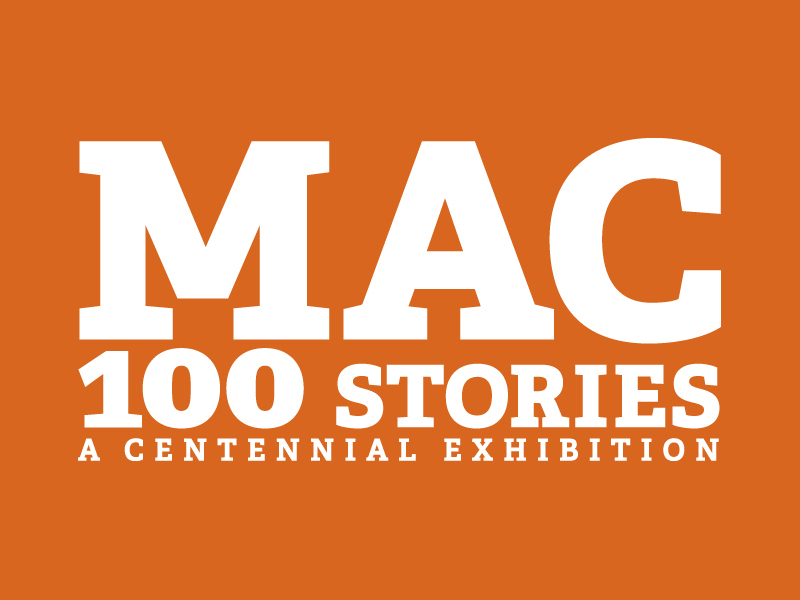 Image L87-1.20265-21 courtesy of the Northwest Museum of Arts & Culture. 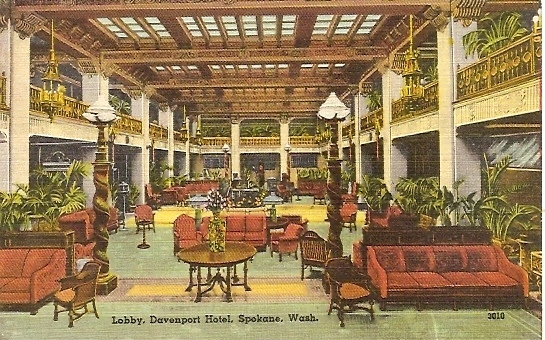 Davenport Hotel and Restaurant: Postcards of Spokane's architecture and sites could be purchased in the lobbies of many Spokane Hotels, including the Davenport. Image L86-729 courtesy of the Northwest Museum of Arts & Culture. 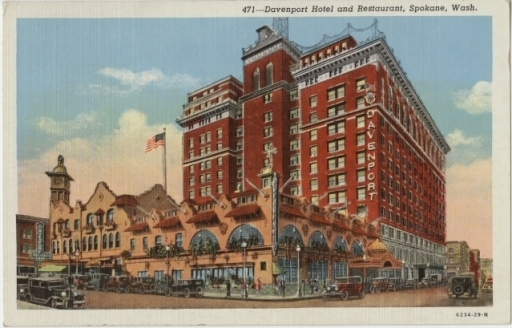 Ian Reeves, “The Davenport Hotel,” Spokane Historical, accessed April 20, 2019, https://spokanehistorical.org/items/show/69.